We all screw up from time to time, hopefully less often as the years go by, and the art of a good apology is invaluable. It also seems to be somewhat lost. There are lots of articles out there about non-apologies, all the ways that people make an attempt at apologizing but fail miserably. And I have to agree with an article I read a while back – a bad apology is worse than no apology at all. Whatever error’s been made, whatever conflict has happened, I’m bound to be carrying anger from the issue. If there were no problem, there’d be no need for an apology at all. So I’m already dealing with negative feelings. A bad apology just pisses me off more. I’d rather you keep quiet so I can work on resolving my own feelings. Try to pass off a bad apology on me? Well, now I just have something new to focus on. Now I’m angry about the initial problem and the crappy apology you threw my way. This life lesson came up with Bear last week. She said something particularly hateful to T-man and, after talking through the encounter with me, she wrote him a letter. The letter was supposed to include an apology. 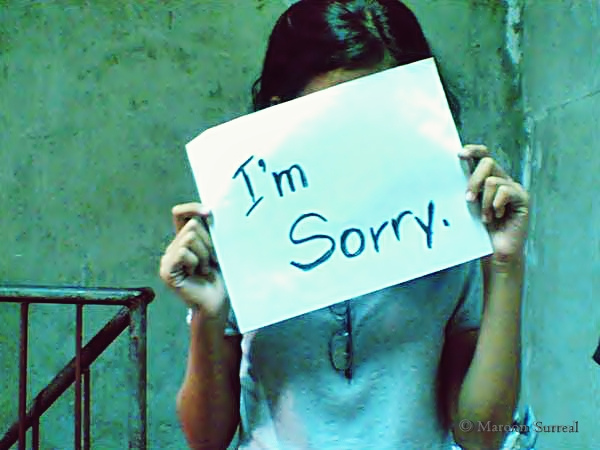 I’m really sorry for saying something that mean. That was way over the line especially on your b-day. I don’t know why I said that. Part of it is I was talking and not thinking. The other part is I was mad that you wouldn’t give me a turn. I am very sorry. I was mad enough to say it because you took the materials, you wouldn’t give me a turn, and the way you said It’s not all about me. Let’s have us a talk, young one. So I sat her down to have a little discussion about apologies. How there are good ones and bad ones. And that the bad ones don’t do anything but make things worse. I’m sorry I hit your bike, but it was lying in the driveway. I’m sorry I took the last doughnut, but I thought it was mine. I’m sorry I used your stuff without asking, but you always do it to me. All “but” statements. Sometimes an apology is a “but” apology without using the word itself, but that doesn’t change the message. I’m sorry I did this thing wrong; here’s my excuse. I’m sorry if you feel like I treated you badly. I’m sorry that my music bothers you. Bear’s letter clearly fell in the first category. Sure, she apologized. But then she spent an awful lot of time listing all the reasons why she was hateful, and since there’s no good reason to be hateful she negated her own apology. After talking about it, Bear added another sentence to her letter. This one was a true apology, not tempered with excuses or disclaimers. Simply an “I’m sorry” for what she’d done wrong. It was sincere, and T-man felt that. If only more people would try genuine apologies when they screw up, the world could maybe spin a bit more peacefully on its axis. Previous Previous post: We all remember. Let’s speak up. Next Next post: Ummm…this isn’t really working for me. It is so true. An insecure apology feels like a slap in the face. They’re pretty good about that, once you can get them to settle down and look at it from the other person’s perspective.